Bayethe nkosi, the salutation given to a chief, is translated from isiXhosa as ‘I salute you, honoured one'. This is the origin of the name of Shamwari Game Reserve's luxury tented camp, Bayethe, where guests are welcomed with the same warmth and respect reserved for the most venerable. The pulse of Africa is strong here in the Eastern Cape, the heartland of the amaXhosa people, whose language is characterized by a series of distinctive clicks.And while you are likely to be entranced by the sounds of one of South Africa's eleven official languages, you will not be expected to get the hang of it during your stay at Shamwari.What you might get the hang of is telling one antelope from another and even distinguishing between the spoor of different animals. Herds of impala, waterbuck, nyala, springbok, bushbuck and other antelope flourish in the dense bush that covers the hills and valleys of the reserve.The Shamwari rangers, who accompany you on early-morning and evening game drives, nature walks and birdwatching expeditions, are always eager to share their knowledge with you.Shamwari has chosen the most comfortable of game-viewing vehicles - open Land Rovers, which give you a close-to-nature experience from the safety of an elevated position.What makes Bayethe different from other lodges is that each of the nine plush tents is made of canvas walls and a thatched roof. 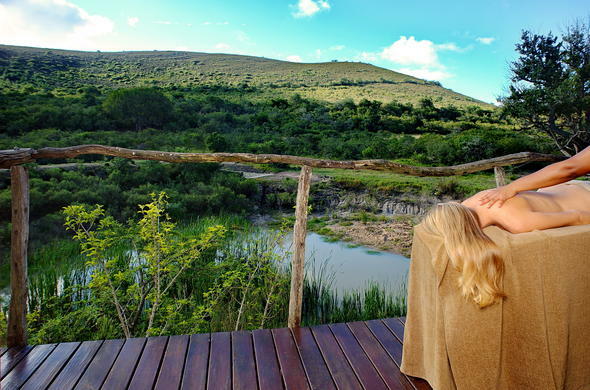 Tented accommodation has never been this classy: your room has wooden floors, an en-suite - bathroom and an elevated wooden terrace that has its own plunge pool sunk into the deck.Visit Shamwari Game Reserve.